Continuous testing of insulation (500/1000 V) and withstand voltage (500 VA transformer capacity). Insulation to withstand series test or witstand to insulation series test at auto mode, or individual test at manual mode. Save up to 10 test settings each for the withstanding and insulation testing modes. Externa I/O, RS-232C interface, Status output (relay contacts). 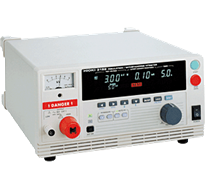 Measurement range, Accuracy : 0.5 MO to 999 MO (at 500 V), 1 MO to 999 MO (at 1000 V) : ±4 % rdg., 1000 MO to 2000 MO : ±8 % rdg. HIOKI 3159 Insulation/Withstanding HiTester is designed for insulation resistance and voltage withstand testing of electrical devices and components according to various safety standards. The 3159 and 3159-02 tests insulation resistance at 500V or 1000V and withstand voltage of up to 500VA in sequence.